As Iris, Nora and Sherloque follow a lead on Cicada, Barry, Cisco and Caitlin continue the pursuit of Dr. Thomas Snow, making a shocking discovery about him and Caitlin's Killer Frost persona. Why did all of Team Flash run or teleport into a site they knew was at near-absolute zero? As Icicle says, "You people are not as smart as I thought." They could have at least put ski-masks on! The Icicle/Killer Frost fight is well shot and the effects work is great. The Icicle is a codename that has been used by one DC Comics hero and three villains, all of whom are related. The first Icicle, Dr. Joar Mahkent, was a physicist who invented a freeze ray that reduced the temperature of ambient moisture. He first appeared in All-American Comics #90 in October 1947. He turned to crime using his invention, became an enemy of the first Green Lantern Alan Scott and joined the first incarnation of The Injustice Society. He later died during Crisis on Infinite Earths, having been one of the villains who attempted to save reality by storming the laboratory of the renegade Oan scientist Krona. The second Icicle was Cameron Mahkent, son of Dr. Joar Mahkent. He first appeared in Infinity Inc. #34 in January 1987. Cameron was a mutant, who developed a natural ability to alter the temperature of the area around him thanks to his father's exposure to the radioactive elements that powered his gun altering his genetics. Though he took his father's name and was a career supervillain who joined both a new Injustice Society and The Secret Society of Supervillains, Cameron cared little for the legacy of his father or The Injustice Society - he was just a self-professed bad person who enjoyed hurting people and taking what he wanted. Cameron was far more ruthless than his father, taking no pains to avoid killing innocents in his crimes. Despite this, he still teamed up with the JSA to retake the world from The Ultra-Humanite, after the other villain successfully took over the world. The third Icicle was a man named James Christie, who was said to have been Joar Mahkent's grandson. He adopted the original Icicle's gun and costume and continued his legacy of super-villainy. He was defeated by his sister, Doyle Christie, who briefly took up the Icicle name to become a crime fighter. However, their stories are likely out of canon, having not been referenced since the two characters appeared in The Flash Vol. 2 #56-58. The Arrowverse version of Icicle is a dark alter ego of Dr. Thomas Snow in much the same way that Killer Frost was an alter ego of Dr. Caitlin Snow. He has the same powers to lower the temperature around him that she does. In the first part of the episode, Cicada fights and kills a woman who has the power to turn her upper arms into large blades. This seems to be a nod to Razorsharp - a character introduced in Robin Annual Vol. 4 #2 (1993) who was created as part of the Bloodlines event. (Special thanks to James Hanifen for the information!) She is identified in a later episode as Raelene Sharp. Thomas Snow mentions three scientists with whom he maintained contact after he faked his death - Louise Lincoln, Victor Fries and Harrison Wells. In the classic DC Comics, Louise Lincoln was the second villain to use the name Killer Frost and Victor Fries became the villain Mr. Freeze. Cisco used an impact extrapolation algorithm to predict where 46 locations where the dark-matter infused shrapnel landed and where Cicada must have been when he was injured. Caitlin measures the amount of dark matter in Cisco's system, determining the levels of concentration were higher than anything she'd seen before. This leads them to conclude that the metal that made Cicada's dagger came from the core of Sally The Satellite. This means that rather than checking 46 locations, they just have to find where the core shrapnel landed. The dermis of Thomas Snow's skin is crystallizing and spreading across his body, due to a cryogenic malignancy and a somatic mutation. It is not contagious but it is rewriting his genetic code. It spreads whenever his emotions spike and will eventually kill him. Thomas Snow reveals that he determined Caitlin had the genetic marker for ALS at a young age. He tested his cryogenic cure for ALS on her after trying it on himself. He made alterations to try to make it safer, but it still caused Caitlin to develop a disassociate identity, which he called Khione. Caitlin suggests creating a serum based on her cells to stabilize Thomas' body. This would require his atoms to stop oscillating, by reducing his body temperature to absolute zero. Thomas says that, in theory, his body should be able to withstand sub-zero temperatures. Barry suggests using a laser-cooling array to freeze Thomas and notes the DOD just built one outside of Central City. This decide is capable of creating isotopes that can freeze carbon dioxide. Cicada is said to have abrasions and possible internal injuries after his last fight. Caitlin's serum, if given to a normal human, will repress their other persona. If given to a cryogenic metahuman, however, it will forever kill off their human side. At extreme cold temperatures, a person won't see their breath because their is no unfrozen moisture in the air. Cisco: (talking to himself) You all think I can just hack anything, huh? Cisco: (confident) Yeah. I can hack anything. Icicle: My daughter! You've returned! Killer Frost: You aren't my family. (gestures to the rest of Team Flash) They are. The Flash: You're not alone anymore. All of Cecile's attempts at playing tough. Cicada's dagger also acts as a metahuman detector. We see him use it to go after a woman who can change her upper-arms into long blades. FEMA set up medical treatment sites after the Enlightenment. Sherloque is reluctant to have Nora come with him and Iris. Ralph goes to get Joe to go to FEMA to get a list of fathers who got medical treatment at their sites after The Enlightenment. He winds up taking Cecile instead. Cisco locates the Tannhauser black-ops site where Thomas Snow was last seen one week after his reported death. It is in the far north, practically at the North Pole. Thomas Snow says he stayed in contact with three scientists after he faked his death - Louise Lincoln, Victor Fries and Harrison Wells. It was Harrison Wells who gave him a full video uplink to STAR Labs, which let him watch the events inside the building but it left him unable to make contact through it. It also only started working again recently. Thomas Snow began experimenting with cryogenics to cure his ALS and he quarantined himself for everyone else's safety. He was able to freeze the progression of the disease but has yet to find a cure. He was able to survive for 20 years by carefully preserving his rations and spending months at a time in cryogenic suspension. The FEMA assistant field director refuses to give Cecile and Ralph any information without a warrant. Cisco is suspicions of Thomas' story. Thonas has missed cherry soda, popcorn, Jitters coffee and peanut butter and jelly waffles. Thomas suddenly collapses in the middle of his walk with Caitlin, his arm icing over as he passes out. Thomas is responsible for creating Caitlin's Killer Frost persona, having used an experimental ALS cure based on cryonics on her. The cure worked, but it caused her to develop a disassociative identity and gave her a metahuman power to generate intense cold. Cicada's daughter's name is Grace Gibbons. The doctor treating Grace seems to hate metahumans. Cecile is not a Trekkie. Iris gives Nora instructions on how to make a vortex, like Barry did when he fought King Shark in 215 and when Iris fought "The Hotness" (aka Eric Fry) in 416. Cisco returns to Thomas Snow's lab and accidentally vibes an image of him putting something into a container of liquid nitrogen. Cisco finds frozen skin grafts in Thomas Snow's lab. This leads him to speculate that Thomas Snow did develop a second personality and that the crystallization of his skin went further than he admitted. Thomas Snow admits that he had been using the skin grafts to cover his face, hands, arms and chest to cover up further outbreaks of his condition. Cecile and Ralph realize the FEMA assistant director has been pocketing the money from various claims and used them to buy himself a Lamborghini. Cicada is seen passing out after returning from the hospital with some kind of medication. Caitlin realizes, a bit too late, that the messages from her father were from his human self and not his metahuman personality. Caitlin is able to change into Killer Frost once again when she realizes that the freeing cold of near Absolute Zero isn't affecting her. She is able to beat back Icicle and destroy the serum before he can use it. Caitlin realized that her mother and father were probably trying to protect her from Icicle. 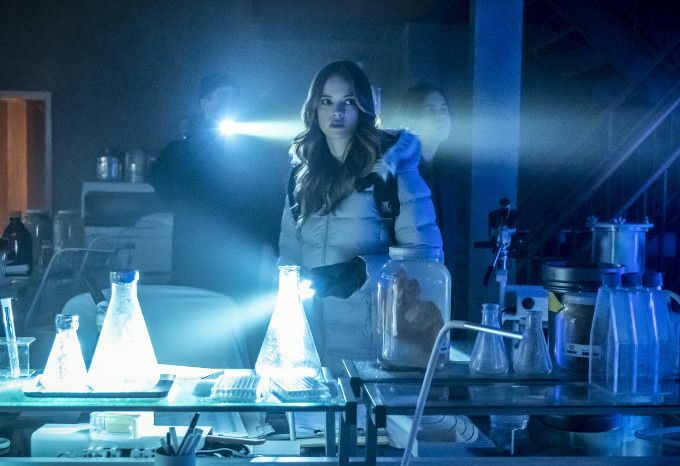 Cisco suggests that when DeVoe attacked Killer Frost, he didn't rewrite Caitlin's DNA to take away her powers using Melting Point's powers in 418. Instead, he used the telepathic powers of Brainstorm to create a mental block that kept her from changing into Killer Frost. Cisco suggests using Harry Wells' mental activity dampener as a means of communicating with Killer Frost so that Caitlin can eventually transform at will again. Iris, Nora and Sherloque recover the core of Sally and confirm it has a lightning-shaped piece of shrapnel missing. Ralph and Cecile determine that three children were hit by shrapnel on the night of the Enlightenment. One of then was a 10 year old girl named Grace Gibbons. Cicada's first name is revealed as Orlin. In the final scene, the doctor discovers Orlin in a weakened state. She offers to treat the wound in his chest but he says that it is making him stronger. Everyone suddenly forgets that extreme cold stops superspeed from working and that ordinary people can't function at -200 below either. A rare episode that gives us more answers than questions. We now know the truth of Caitlin's powers and her father's story and how Cicada became who he is. The only real questions now are what happens next with all of this. Still, the whole thing feels a little flat due to a lack of action and our characters having to be total idiots in order for the villain to be a threat. Still, the ensemble acting is solid enough and it's worth it to have Killer Frost back.